Carl Sagan said that if you want to make an apple pie from scratch, you must first invent the universe. When he says “from scratch,” he means from nothing. He means from a time before the world even existed. This is my current read at the moment, and I’m loving it! Nicola Yoon has such a natural way with words, and the writing is effortless to read. I’m also enjoying the dual-narrative aspect and the chapters providing backstory to more minor characters – in that sense it reminds me of the narrative style in The Book Thief. It’s quirky; I like it. 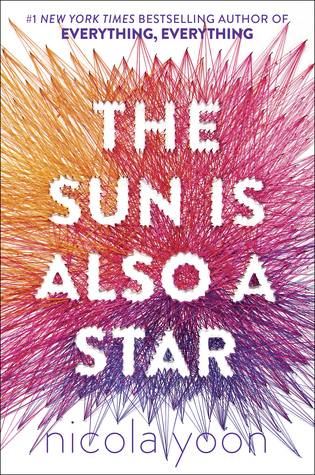 I keep hearing good things about Nicola Yoon- it’s about time I picked up one of her books! Thank you for continuing to host First Lines Fridays! I’ve seen this in the bookshop so many times. I loved the quote. I’ve already got Carl down as an over-thinker. Here’s my link. Hope it is OK that I used the arrows. 🙂 Many thanks for hosting.